Plantar Fasciitis is the most common cause of heel pain, especially in middle-aged people. 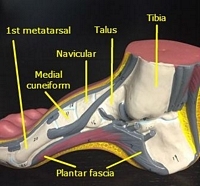 The plantar fascia is the flat band of ligaments that connects the heel bone to the toes. Its role is to support the arch of the foot. If the plantar fascia is strained, it gets weak, swollen, and inflamed which can cause pain when the person stands or walks. Plantar fasciitis is more common in middle-aged people, but it can affect younger people who are very active such as athletes or soldiers. This condition can affect one or both feet. The Center for Disease Control and Prevention's National Centre for Health Statistics found that plantar fasciitis is responsible for an average of one million patient visits to doctors. Age: Plantar fasciitis is more common in people between the ages of 40-60. Specific exercises: Activities such as long distance running, ballistic jumping, ballet dancing, and aerobic dance put pressure on the heels and can cause plantar fasciitis. Foot mechanics: Having an abnormal pattern of walking and being flat footed disturbs the weight distribution on the feet and can put stress on the plantar fascia. Occupations: Certain occupations such as factory workers and teachers who spend most of the time standing are at higher risk of plantar fasciitis. Physical exam: Physical exam is performed by a doctor who will look for swelling, tenderness, pain, or any skin changes to diagnose the problem. X-ray: Fractures and damage to the plantar fascia can be detected by simple X-rays. Magnetic resonance imaging (MRI): A detailed image of the heel is obtained by MRI that helps in diagnosing any underlying causes of heel pain. Computer tomography (CT scan): A CT scanner takes several X-rays and a detailed image of the foot and heel is developed by a computer which gives even more detailed pictures to diagnose minor injuries as well. Several pain medications such as ibuprofen and naproxen sodium are helpful in relieving the pain and inflammation caused by plantar fasciitis. Stretching and strengthening exercises and the use of specialised devices can be helpful in relieving pain. Physical therapy: A physical therapist will teach the patient exercises to strengthen the plantar fascia, Achilles tendon, and lower leg muscles that keep the ankle and heel stabilized. The therapist can also teach the patient how to support the bottom of the foot by applying athletic tape. Night splints: Patients of plantar fasciitis can be recommended to wear splints by a doctor that stretches the calf and the arch of the foot while the patient sleeps. The splint holds the plantar fascia and Achilles tendon in an extended position overnight and helps in stretching. Orthotics: To help distribute the pressure to the feet more evenly, the doctor can recommend off-the-shelf or custom-fitted arch orthotics. Steroid injections: injecting steroid injections into the heel can help in temporary heel pain relief, but it is not recommended for the long term as it may weaken the plantar fascia and may cause it to rupture. Extracorporeal shock wave therapy: in this method, sound waves are directed at the painful heel area to stimulate healing. This method is recommended for chronic plantar fasciitis patients that are not responding to more conventional methods. Side effects are bruising, swelling, pain, numbness or tingling in the heel. Some studies have shown promising results, but it is not consistently effective. Tenex procedure: this is a minimally invasive procedure in which the scar tissue of plantar fasciitis is removed without surgery. Surgery: in extreme cases where all the other methods fail to relieve the pain, surgery is the only option left. In surgery, the plantar fascia is detached from the heel bone. A side effect of surgery is a weakness of the arch in the foot. Alpha granules contain growth factors and they are the main focus of platelet-rich plasma therapy. There are three stages of healing after platelet-rich plasma Prolotherapy injection and different types of growth factors are involved in driving different stages. Inflammation phase: It lasts for 2-3 days. In this phase, growth factors are released. Proliferation phase: It lasts for 2-4 weeks. It is vital for musculoskeletal regeneration. Remodelling phase: It lasts over a year. In this phase, collagen is matured and strengthened and the injury is healed. 20-30 mL of blood is used to make platelet-rich plasma. The blood is spun for 15 minutes at 3,200 rpm in a centrifuge machine. This step separates platelet-rich plasma from platelet-poor plasma. 3 mL of platelet-rich plasma is obtained from 20 mL of blood. The platelet-rich plasma is added to half mL of sodium bicarbonate to neutralize its pH. The injection is administered with the help of a dynamic musculoskeletal ultrasound with a transducer of 6–13 Hz to maximise the location accuracy for the injection. The injection is administered directly at the site of injury. 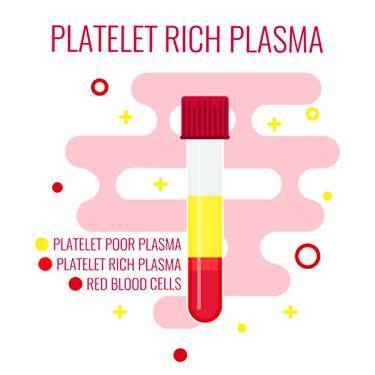 As the platelet-rich plasma Prolotherapy technique uses the patient's own blood, the chances of an immunogenic reaction or the transfer of blood borne diseases are completely eliminated. PRP prolotherapy is a new treatment method that can be helpful in treating plantar fasciitis. It can not only relieve the pain, but also repair the damaged ligament. There are several types of researches going on to evaluate the effectiveness of PRP prolotherapy for plantar fasciitis and most of the results are in favour of PRP prolotherapy as a treatment option for plantar fasciitis. The effectiveness of PRP prolotherapy is evaluated by preclinical and human cell culture studies. The studies have shown increased tendon repair without scar formation after PRP injections. Another study showed a 60% improvement in the patients treated with platelet-rich plasma Prolotherapy for damaged tendons. Doctors writing in British Medical Bulletin evaluated the effectiveness of platelet-rich plasma prolotherapy for the chronic plantar fasciitis and found PRP prolotherapy effective in treating the condition. A study conducted on 24 plantar fasciitis patients reported clinically and statistically significant improvements in all result measures during the research. Also, there was no side effect associated with PRP injection. PRP prolotherapy repairs plantar fasciitis by strengthening the plantar fascia ligament and by providing support to the arch of the foot. PRP Prolotherapy regenerates and strengthens the weakened ligament. In 2012, in a meta-analysis, the efficiency of steroid injection and PRP Prolotherapy were compared. The results showed that the effect of steroid injections was very short term as compared to PRP injection, but PRP needs more research to determine the duration of efficiency. The patient will experience some soreness after receiving a PRP injection so it is recommended to wear loose-fitting footwear. 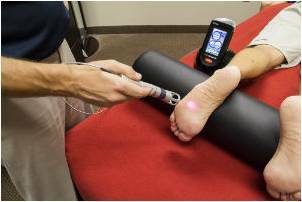 Evidence for the use of PRP prolotherapy in plantar fasciitis shows encouraging results and it is safe. However, the number of available studies is limited and placebo-controlled studies are required. 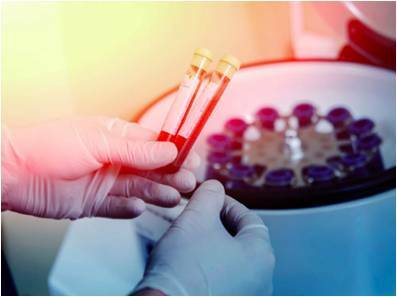 While PRP and stem cell treatments are enhancing the tissue repair and regeneration, conservative treatments can enhance healing, strengthen the muscles, and stabilize joint movements to maximize your recovery. Photons of light from lasers penetrate into tissue and accelerate cellular growth and reproduction. Laser therapy increases the energy available to the cell so it can work faster, better, and quickly get rid of waste products. When cells of tendons, ligaments, and muscles are exposed to laser light they repair and heal faster. Laser light increases collagen production by stimulating fibroblasts. Collagen is the building block of tissue repair and healing. Laser therapy increases fibroblast activity and therefore collagen production to speed healing. Low-level laser therapy decreases scar tissue formation. Scar tissue can be a source of chronic pain and poor healing. By eliminating excessive scar tissue and encouraging proper collagen production, painful scars and chronic pain is reduced. Laser therapy causes vasodilatation (increases the size of capillaries) which increases blood flow. The treatments also increases lymphatic drainage to decrease swelling or edema. Therefore, laser therapy reduces swelling caused by bruising or inflammation while speeding the recovery process. Cold laser therapy decreases pain by blocking pain signals to the brain. Some nerve cells sense pain and send signals to the brain. Chronic pain can be caused by overly active pain nerves. Specific wavelengths help "shut off" the pain signals, thereby eliminating your pain. Low-level lasers are excellent at decreasing inflammation, which also increases pain nerve activity. Cold laser therapy also increases endorphins and enkephalins, which block pain signals and decrease pain sensation. Overall laser therapy reduces painful nerve signals and reduces your perceived pain. Blood carries nutrients and building blocks to the tissue, and carries waste products away. Increased blood flow to tissues increases and enhances cellular healing. Cold laser therapy increases the formation of capillaries in damaged tissue. Specific laser frequency also increases blood flow to the area treated to enhance injury repair. Low-level lasers increases enzyme activity to improve metabolic activity that affects cell repair and regeneration. The enzymes are turned on "high" to speed the healing. Nerves heal very slowly. Lasers speed up this process. Damage to nerves causes numbness, pain, muscle weakness, and altered sensations. Laser therapy treatments enhance nerve function, healing, and reduce pain. ATP is like gasoline for cells, it is the energy source that cells operate. Injured cells often have low levels of ATP, which decreases their ability to heal and repair. By increasing ATP and "gasoline storage levels," cells have the ability to heal and repair. Therapeutic treatments for addressing soft tissue injuries involve massage therapy, manual therapy, trigger point therapy, Graston Technique, or Active Release Technique. These treatments increase blood flow, decrease muscle spasms, enhance flexibility, speed healing, and promote proper tissue repair. When these treatments are incorporated into a treatment plan, patients heal faster and are less likely to have long-term pain, soft tissue fibrosis, or scar tissue in the injured muscle. These soft tissue treatments are incorporated with therapeutic exercises and flexibility programs. Many leg injuries are associated with radiating pain. The two legs function as a system for movement. Injuries in one area of the system are commonly associated with poor joint stabilization in the foot, knee, or hip. This leads to poor alignment and excessive forces being placed onto muscles and tendons. Knee injuries are common because of weakness and poor stabilization of the leg and hip muscles. The combination of muscle weakness, poor coordination, and altered gait mechanics produce excessive strain on the soft tissues. The lower extremities work as a comprehensive unit performing many of the repetitive tasks at home, work, and recreational sports. Injuries to one area of the musculature often indicate that additional damage has been incurred by other muscles. Many therapeutic exercises can help restore proper strength and endurance to the leg muscles. Isometric exercises are often the initial treatment exercises, followed by single plane rubber band exercises for hip, knee, and ankle; flexion, extension, adduction, abduction, circumduction, inversion, and eversion. Dynamic exercises involving stability foam, rubber discs, exercise balls, and BOSU balls can be performed on the floor. 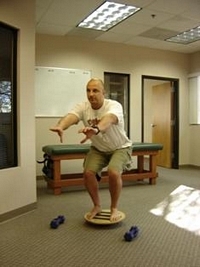 The more unstable of the surface the more effort and stabilization is required of all the lower extremity muscles. Vibration plates enhance neuromuscular learning throughout the ankle, knee, foot, hip, and back muscles. Additional strength exercises can be found on the hip, knee, and foot strengthening pages. More information for injuries and treatments foot pain and exercises. Landorf, K. B., & Menz, H. B. (2008). Plantar heel pain and fasciitis. BMJ Clin Evid. Tiwari, M., & Bhargava, R. (2013). Platelet rich plasma therapy: A comparative effective therapy with promising results in plantar fasciitis. Journal of Clinical Orthopaedics & Trauma, 31–35. Wilson, J. J., Lee, K. S., Miller, A. T., & Wang, S. (2014 ). Platelet-rich plasma for the treatment of chronic plantar fasciopathy in adults: a case series. Foot Ankle Spec, 61-7.